A new paper published yesterday highlights the potential of the SKA to tackle key questions of cosmology, by presenting a detailed overview of the various observation campaigns that can be conducted with the telescope once built. Cosmology is the study of the origin and fate of the Universe. Cosmologists believe that ordinary matter – the matter that forms everything we see including planets and galaxies – only accounts for around 5% of the total mass & energy content of the Universe. 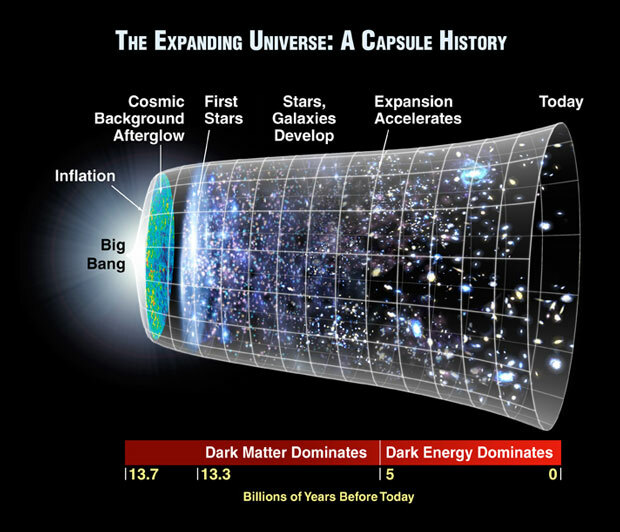 Two mysterious components seem to constitute the rest with dark matter – matter we can’t see directly but whose gravitational effects on normal matter we can observe – constituting around 27% of the remaining content and dark energy – the force causing the Universe to expand at an accelerated rate – accounting for the remaining 68%. The Red Book as it is called is the product of the SKA’s Cosmology Science Working Group, a group of around 130 scientists from 70 different institutes in 19 countries interested in using the SKA that represents the wider cosmology community*. It builds on the work of the 2015 SKA Science Book, taking into account the major developments in the field since then. With 46 authors from 36 institutes contributing directly to the writing of the paper, it represents a significant piece of work on the science potential of the SKA to address key issues in cosmology such as dark matter and dark energy. The Red Book details the cosmological surveys that the SKA will carry out, and the science they will enable, including establishing the proportion of dark energy in the Universe thanks to percent-level precision measurements of its expansion rate over the last 12 billion years. There have been major discoveries in the past few years which have implications for the field of cosmology, including the detection of gravitational waves predicted by Einstein by the Advanced Laser Interferometer Gravitational-Wave Observatory (LIGO) in the United States, and the detection by the EDGES experiment located on the site of the future SKA-low telescope in Western Australia of what could be the signal from some of the first stars to form in the universe, one of the key science goals of the SKA. EDGES telescope in a radio quiet zone at the Murchison Radio-astronomy Observatory in Western Australia. These discoveries bring new questions within cosmology, especially on the nature of dark matter. Astronomers are now working on their observational implications and how the SKA could help to confirm the results, in particular through synergies with other upcoming ground-breaking telescopes which observe the Universe at different wavelengths such as ESA’s Euclid space telescope and the Large Synoptic Survey Telescope (LSST) being built in Chile. *A total of 13 Science Working Groups and Focus Groups representing more than 500 scientists across 20 countries work on developing the science case of the SKA. From Cosmology to Magnetism & Solar Physics, they cover the various fields of interested users from the astronomical community. The Square Kilometre Array (SKA) project is an international effort to build the world’s largest radio telescope, led by SKA Organisation. The SKA will conduct transformational science to improve our understanding of the Universe and the laws of fundamental physics, monitoring the sky in unprecedented detail and mapping it hundreds of times faster than any current facility.